Usher's adorable performance on "Sesame Street" this week calls to mind some pretty amazing musical guests to lend their sizable talents to the acclaimed children's show, which incredibly debuted more than four decades ago in 1969. Some of our favorites includes everyone from the "Yeah" singer to Johnny Cash to R.E.M. to Norah Jones. 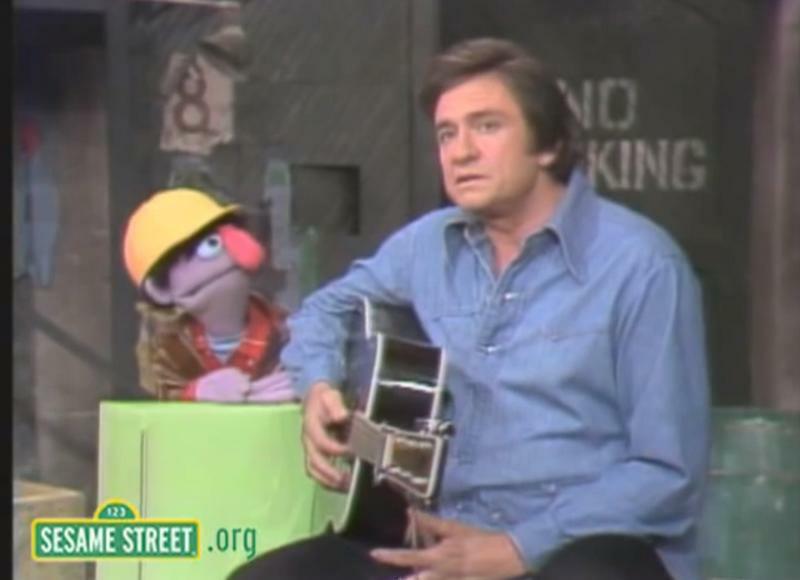 Johnny Cash - Leave it to Johnny Cash to bring gravitas to his "Sesame Street" performance from 1973. He teams up with construction worker Muppet, Biff, to sing "Five Feet High." After a cute bit in which Biff gets Johnny's name wrong and gushes, "My wife Ethel isn't gonna believe I saw you!" Cash explains the inspiration for the classic tune. Although it's a morbid tale about a flood he saw as a child, they have some fun with it, and Biff stacks up building blocks to represent each foot the water rises. It's hard to think of a cooler way to learn to count than from the Man in Black himself! Usher - With the help of a motley "Sesame Street" cast including Elmo, Grover, Murray and Abby Cadabby, Usher has us dancing from the very first note of his alphabet jam. The "Love in This Club" singer teaches kids their ABCs to a simple, catchy beat. "Be like a crustacean and do the crabby crawl," he sings for C, and "act like an octopus, it's not that hard" for O. Usher dances around with a giant grin on his face and it looks like he's having a ball. It's contagious! Feist - It's hard to think of an indie-rock song more perfectly suited for teaching kids how to count than Feist's "1,2,3,4." The Canadian songstress modified her 2007 hit and gave it an adorable, G-rated twist. "1, 2, 3, 4 chickens just back from the shore" she sings as hens wearing hats and sunglasses dance and sing along. In her warm, earthy voice, Feist counts "1, 2, 3, 4 penguins that were by the door" in the popular video that went viral and has been viewed millions of times by kids and adults alike. Katy Perry - The most infamous "Sesame Street" musical guest award goes to…Katy Perry! The well-endowed pop star was reportedly banned from the children's program for showing more cleavage than many parents wanted their pre-school-aged kids to see. Although "Sesame Street" released the video on YouTube, the powers that be decided it would not air the segment on television due to parents' objections about her outfit not being suitable for the young audience. Some of the parents' comments included: "They're gonna have to rename it cleavage avenue," and "My kid wants milk now." But all is not lost, you can still watch Perry's spirited, rockin' romp with Elmo here. R.E.M. - R.E.M. transformed one of their biggest, poppiest hits, "Shiny Happy People" into "Furry Happy Monsters" for the benefit of the kids with help from some of the "Sesame Street" cast, and it's utterly charming. Michael Stipe, Mike Mills and Peter Buck sing, play and jump around with a colorful assortment of Muppet monsters, while a Kate Pierson look-alike Muppet sings harmonies (the B-52's singer is a guest vocalist on the original tune). It’s all fun and games, until the "furry happy monsters feeling glad" turn glum, "crying, crying…sad sad times have come." While some have suggested that this is an ode to kids with bi-polar disorder (seriously), it seems much more likely that it chronicles the wide array of emotions kids often feel, going from happy to sad in a matter of seconds. It reminds us that these feelings are completely normal and that sad times will pass, especially if we watch this video! Paul Simon - Paul Simon's visit in 1977 to the now-famous brownstone steps at 123 Sesame Street is undoubtedly a classic moment in the program's musical history. Sitting on the steps with an acoustic guitar, Simon is joined by a gaggle of kids who sing and dance along as he performs his 1972 hit "Me and Julio Down By the School Yard." While Simon's performance is pitch perfect, it's his young sidekick who steals the show. An adorable girl in a denim jumpsuit enthusiastically improvises lyrics and claps along to the song in her head, and although her singing is a little bit off-key, the moment is priceless. Billy Joel - Another fantastic "Sesame Street" blast from the past comes from Billy Joel, who teamed up with actress Marlee Matlin to serenade Oscar the Grouch with a reworked version of his hit "Just the Way You Are." Wearing wayfarers and a plaid jacket, the crooner sings "Don't go changing just to please me/ 'Cause being friendly's not your style" while Matlin follows along in sign language. The message it sends is clear– be who you are and don't worry what anyone else thinks. There's some great comic relief when Oscar complains about having to listen to the love song and moans, "This is the mushiest thing I've ever heard." That doesn't faze Joel and Matlin, who continue to sing and lavish him with affection. In addition to sending an important message to kids about being yourself, it's a powerful reminder of Joel's effortless vocal talents. Jason Mraz - Jason Mraz mixes things up when he starts out his guest appearance inside of a Laundromat. The Grammy-winning singer transformed his tune, "I'm Yours," into "Outdoors," which extols the virtues of going outside. Mraz is joined by classic "Sesame Street" characters including Elmo and Big Bird for the good vibes tune that encourages kids to go outdoors and play. Ray Charles - The late, great Ray Charles appeared on "Sesame Street" a handful of times, but one of our favorites is when he duets with Elmo on "Believe in Yourself." Charles starts off by practicing a new tune while reading music in Braille. When Elmo asks what he's doing, Charles explains that he's reading music with his fingers because he's blind. It's another example of how the powerful message of accepting others is cleverly conveyed in many of the best "Sesame Street" musical performances. "You can be what you want to be, do what you want to do, believe in yourself," Charles croons. Who are we to argue with the master? Norah Jones - In a clever twist, Norah Jones "Sesame Street"-ified her Grammy-winning song "Don't Know Why" by changing it ever so slightly to "Don't Know Y." As you might have guessed, it's a great lesson in spelling words that begin with the letter "Y," yet somehow it's a melancholy affair because Y is nowhere to be found. "I don't know why Y didn't come," Jones sings, remembering happier times when they spelled "yarn" and "yogurt" together. As usual, Elmo offers some cute comic relief.